Close to the towns of Pigeon Forge and Gatlinburg, and convenient to all the outdoor opportunities of the Smokies, yet far enough away to enjoy the peace and tranquility of the mountains. Willow Ridge is perched in a clearing on a full acre of land with only a few cabins in sight. In fact, The drive is only 7.3 miles from Willow Ridge to the Pigeon Forge Parkway (less than 10 minutes)--really convenient! Close enough to be part of it all, and yet far enough away to experience mountain peace. Our luxury retreat is a smoke--free 1,300-square foot log cabin with spacious exposed-beam vaulted ceiling interiors, hardwood floors, and golden knotty-pine walls. Two private bedrooms, a fully equipped kitchen, pool room with floor-to-ceiling windows, and an upper-level office cove complete with computer, cordless phone (with free local and long-distance [US] service), and satellite wi-fi make this a perfect mountain retreat you'll never want to leave. How does one enjoy a mountain getaway without enjoying a sprawling deck complete with locally crafted rockers and a four-person spa? It's where you'll spend every waking minute—even in the winter, when the meticulously maintained spa is heated to the perfect temperature. And don't forget about the deck-side gas grill: you may never spend time inside! The spacious upper-level master bedroom features vaulted ceilings and expansive views, along with a wall-mounted flat-screen television. A sunny nook facing south allows natural light to spill into the room (perfect for an afternoon nap). Store your clothing in our antique armoire complete with hanger rack and built-in drawers. The stacked-stone garden tub sits just outside the full bath with walk-in shower. A solid wood king-size sleigh bed invites you for a good night's sleep. And the soft carpet will keep your feet warm on those cool winter nights. Our downstairs guest bedroom features a wrought iron queen bed with silky-smooth linens. For those cool mountain evenings, tuck up underneath the fluffy down comforter and crack your windows to tune into the morning songbirds. Complete with a private closet and southeast deck views, the guest bedroom opens into a semi-private bathroom with shower/tub. The living room features a floor-to-ceiling stacked-stone gas log fireplace and a huge flat screen television with DirecTV. Have a seat on our leather reclining armchairs, or curl up on the leather sofa. Two glass doors open up to the wraparound deck, and massive windows give you views of the woodland mountain ridges all around. Only the best would do in our gorgeous pool room perfect for those nights with a cold beverage and a healthy dose of competitive spirit. The AMF/Brunswick solid wood claw foot table provides the finest playing experience with slate top and ultra-smooth felt. Pull up a solid wood saddle stool at the cross-through breakfast bar and watch friends play the night away. We've equipped Willow Ridge with all of the comforts of home, and we'd like to share it with you. Spend your next vacation at Willow Ridge, and enjoy a secure, peaceful retreat that offers an escape from the day's excursions to nearby Dollywood, Ripley's Aquarium, Cades Cove, the many hiking trails of the Great Smoky Mountains National Park, and the arts and crafts community of Gatlinburg. *Restrictions apply; inquire about your needs. We love the Smokies. Spending time at Willow Ridge is a treat we cherish. Willow Ridge gives us a chance to experience pure tranquility—from the time on the deck (morning, evening, and anytime we get a chance in between) to hiking the hundreds of nearby mountainous trail heads to our afternoon motorcycle rides through nearby sleepy, rolling back country roads of Wears Valley and the Great Smoky Mountain National Forest. Willow Ridge is our retirement home. It's our future. And until we can find the time to be here full-time, we want to share it with you. A home this rich in character and amenities deserves to be enjoyed by people who can fill its golden sunlight-drenched afternoons with laughter, comfort, and peace. toilet, combination tub/shower, Semi-private for guest room and main living access. Perched on a mountain ridge with a bird's-eye view of it all. South and west mountaintop views from covered wraparound deck. Near Pigeon Forge, Gatlinburg, and Great Smoky Mountain National Forest. Free local and long-distance (U.S. only). Separate controls for main level and upstairs master bedroom. Cotton blend linens with extra blankets in chest and closet, laundered freshly before each guest. Stacked-stone, floor-to-ceiling gas fireplace in main level living room (with timer). Paved parking for two full-size vehicles (or three small) with Y-shaped turnaround for easy in/out. Note: driveway is steep and may need 4WD if snow or ice. Plenty of towels: bath, hand, wash -- even though there's a laundry room in the cabin, you may never need to use it! Loft ceilings and floor-to-ceiling views of the woodlands and mountain ridges. Heart-pine floors and gas fireplace. Leather couch and two leather recliners. Coffee table with games. Full-size french-door refrigerator with freezer and ice maker. 5-burner (includes extra 'warming burner') glass-top range. Electric oven with 5-burner (including warmer) glass-top stove. 4-slice toaster for bread and bagels and everything in between. Bowls, plates, cups, mugs, glasses (wine, juice, beverage), plastic insulated cups, serving tray & bowl, pots and pans, blender, small food processor, serving and cooking utensils, and silverware. Any foodie would love our nicely outfitted kitchen with beautiful appliances and cabinets stocked with every dish, pot, pan, cup, custom mug, and utensil you'll need while at Willow Ridge. Farmhouse table with chairs and bench. Two, in living room and upstairs master bedroom. Flat-screen high-definition televisions. (2) DirecTV (with DVR) for living room and master bedroom (upstairs). No DVD player. Books in both the master bedroom (upstairs) and guest bedroom (main level). Card games, board games in living room coffee table. Seven-foot AMF slate-top table with solid wood claw-foot structure. Absolutely gorgeous and ready for a little friendly competition. Beautiful sloped lawn with a view. Covered wraparound deck spanning south- and west-facing views, including five adult-sized wood rocking chairs and two youth-sized. Community tennis courts for year-round use. Complimentary use of the community pool from Memorial Day until Labor Day. Also, community tennis courts (we have racquets & balls in our cabin for you to use). Four-person Great Lakes hot tub on west-facing deck. Master bedroom also has a large garden tub. Willow Ridge is a smoke-free 1,300-square foot luxury log cabin with spacious exposed-beam vaulted ceiling interiors, hardwood floors, and golden knotty-pine walls. Two private bedrooms and bathrooms, a fully equipped kitchen, pool room with floor-to-ceiling windows, comfy living room with stacked-stone gas fireplace and leather furniture, wraparound covered deck to watch all of the creatures outside, and free satellite wi-fi make this a perfect mountain retreat you'll never want to leave. We had a wonderful time staying at our cabin at Willow Ridge. It was very peaceful and quiet and just what we were looking for!! We can't wait to book our next vacation, preferably in the Shagbark community!! This cabin was exceptionally beautiful, clean, centrally located yet secluded. The owner was wonderful and easy to reach. There are so many details that make this cabin so unique and welcoming. I highly recommend this property whether you are traveling alone or with children. What a beautiful cabin with comfy beds and great scenery. The hot tub was excellent and the master bed room is really it’s own little retreat. Far enough away from the hustle and bustle of pigeon forge to seem private but close and convenient to everything. The owner was very gracious and helped us check some last minute visitors in with the gate attendants. I love that it’s gated giving you an added measure of security. Several things kept me from giving five stars. 1. The pool table was nice but pool sticks were rather generic and three of the five needed new tips which were not provided. I’m sure the owner will fix ASAP for the next renters. 2. Despite the provided lamps the lighting at night is pretty dim in there. 3. Because the cabin is in a community (HOA) Your hot tub experience must end at 10 PM! 4. The driveway is extremely steep so if you’re booking in the winter make sure you get vacation insurance to cover you for weather related cancellations even with four-wheel-drive I would be surprised if you could get up or down that driveway with snow or ice. 5. The upstairs fireplace in the master did not work but the owner is already working on getting that fixed and parts are ordered. 6. The Jacuzzi tub jets stuck on for us we called the owner late at night/early in the morning because we could not get it to shut off she was gracious took our call right away and help us get it shut off properly. She indicated she will be having someone look at it to make sure it works properly for the next renters. 7. Would also recommend having a couple more bath towels in each bathroom. As an FYI you probably will not get cell reception up on the mountain where the cabin is located but the cabin does have Wi-Fi. Please do not let any of these “negatives” keep you from renting this cabin it was a great experience the owner is gracious and the cabin was beautiful our family had a wonderful time and enjoyed our time in this cabin. We were just contemplating when we left today of renting it again soon. 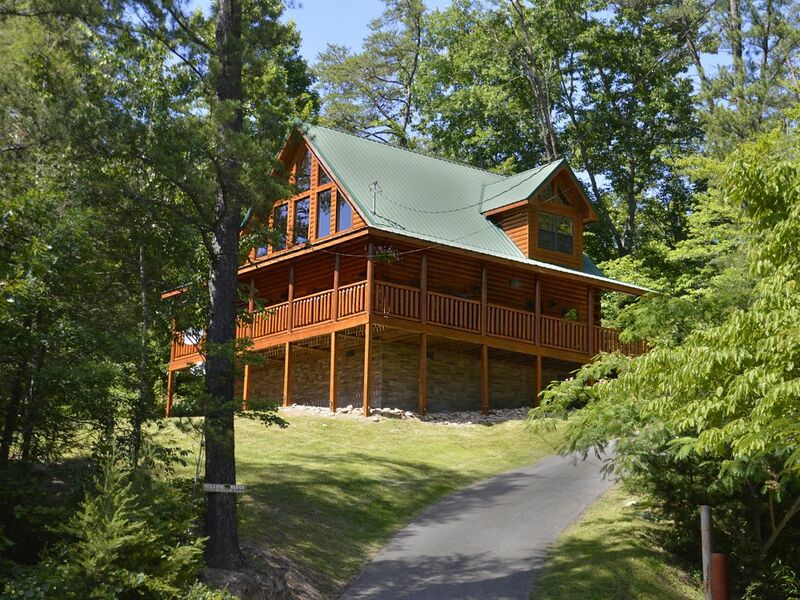 A cute but spacious cabin in a gated community in the Smoky Mountains. We have stayed in a lot of cabins but this is definitely one of our favorites. We've stayed at many cabins in the area, Willow Ridge is probably the nicest. Sheri has taken great pride in her cabin and it shows in the sweet touches here and there. The kitchen had everything we needed to make Thanksgiving dinner, even a pie pan and turkey baster! The linens are soft, the beds are comfortable and there are no bed bugs (important). The hot tub was hot and clean. The cabin was spotless and has beautiful views. It's close to other cabins, but not so close you feel like there's no privacy. The driveway is steep, but parking is flat and easy to turn around in. We had a great time and the cabin was great. We even bought two of Sheri's cards, her artwork is beautiful. Perfect Cabin in the Mountains! What a wonderful week we had At Willow Ridge! My husband and I stay at Shagbark every year because of it’s location to park. This cabin was everything we had hoped for. It was so private. Kitchen had everything you could possibly need. Hot tub was so relaxing after a day of hiking. The cabins decorations are so perfect for a cabin in the mountains. The master bedroom was large and bedding very comfortable. WiFi was strong and direct TV didn’t lose connection even with some fairly strong winds one night. My husband loved the pool table. The owner was very receptive always responded promptly. I highly recommend Willow Ridge for a Smokey Mountain getaway. Thanks for the complimentary bottle of wine and allowing us to stay in your beautiful home. Willow Ridge is perched on a ridge within the Village at Shagbark, a residential community in Sevierville, Tennessee—just a stone's throw from Pigeon Forge, Gatlinburg, the Foothills Parkway, and the Great Smoky Mountains National Park. Our community is a gated, 24-hour guarded oasis of nearly 1,300 acres of mountainous woodlands. It's a secure, quiet, peaceful retreat that offers an escape from the day's excursions to nearby Dollywood, Ripley's Aquarium, Cades Cove, and the arts and crafts community of Gatlinburg. Rates are subject to change until reservation is confirmed. Note: Weekly rates are based on a seven (7) night stay. All guests must sign our short-term rental agreement, even if you have made--and we accepted--your "reservation request." Upon receiving your reservation request or serious inquiry, we will send you the rental agreement for signature and return.